Our alluring collection of Kabaddi Sports Wear consists of a half pant and half round neck t-shirt. This sports wear is made of high quality soft fabric and breathable lining material that will keep your cool and dry even after long playing hours. It is stitched with help of advanced machine to ensure its seamless stitch and elegant finish. This sports wear fits perfectly to wearer and provides extreme comfort. The elegantly crafted trouser allows comfortable movement of legs while playing. 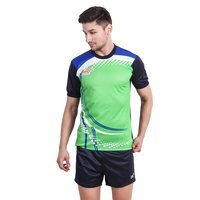 In addition, Kabaddi Sports Wear is available in alluring color combination and is printed with players' name.